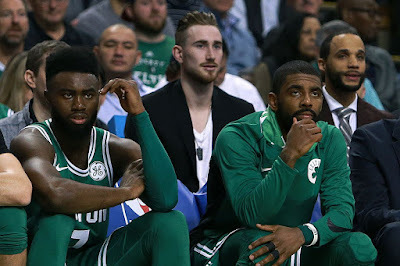 HayWatch: Gordon is "...just about full speed"
While Marcus Smart might be waylaid with the flu, certain other key members of the 2018-19 Boston Celtics are almost ready to get back on the court. We've heard Kyrie Irving is just about ready to resume full basketball activities, and it seems Gordon Hayward is, too. He's even dunking the ball without issue, which has got to be something difficult mentally if not physically, given how he injured himself in the first place. Sprinting and lateral movement are coming along nicely for the former Butler wing, and he should be ready to play normal, NBA-level basketball very soon, perhaps before the end of the month. Watch the videos above to hear how Hayward's progress has been coming along, and how he feels about recent events, from the Marcus Smart re-signing, to the Kawhi Leonard trade.